A group of film students preparing to shoot their movie, “The Bored Murderer.” The director, Naoki (Shûji Kashiwabara), is continually hounded by his clinging girlfriend Yukari (Hinano Yoshikawa). He’s distant and dismissive of her, using her for money, cheating on her… the crew calls her “Adele” in reference to The Story of Adele H. and its doggedly devoted protagonist. Assistant director Kiyoko (Ai Maeda) struggles with her own romantic pursuers while trying to keep the film on track. The lead actor had to bail at the last minute and is replaced with the odd, sexually ambiguous Ikeda (Hideo Nakaizumi), who tries to understand his role. And Professor Nakajo (Hirotarô Honda) — who his pupils call “Aschenbach” after Death in Venice — quietly longs for a young student named Rei (Meisa Kuroki). 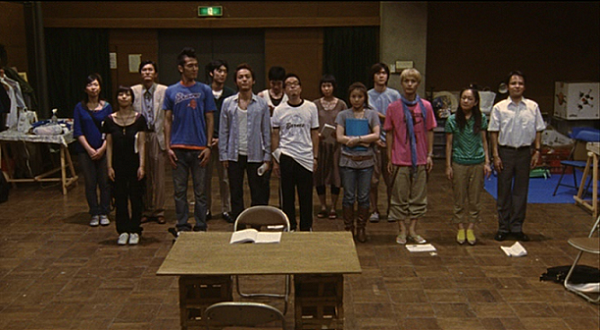 Also in this compelling cast of characters: the outgoing cinematographer Motosugi (Shinnosuke Abe), the nervous and geeky producers Kamimura (Junpei Suzuki) and Yoshizaki (Mitsunori Isaki), the older art director Oyama (Tomorowo Taguchi) who becomes Nakajo’s link to Rei, and spacey continuity girl Aya (Yuko Takada). I mention all these people because this is a true ensemble piece. While most of the focus is on Naoki, Kiyoko, Ikeda and Nakako, everyone plays a significant part and we get to know all these characters. Comparisons to Altman are apt, and the characters themselves reference Altman in the opening shot… a long tracking shot that begins with students discussing long tracking shots. While the multiple references throughout hit all the right cinephile buttons, it’s not just an exercise in being meta. In a way it’s about people trying to find the film between film and their lives. They easily box themselves and each other into predetermined roles and archetypes, but the line between art and reality is blurry and shifting. Are we fated to play to type, or can we break character? This entry was posted on March 22, 2013 at 5:06 pm	and is filed under Movie Reviews. You can follow any responses to this entry through the RSS 2.0 feed. You can leave a response, or trackback from your own site.